At this secondary school in rural Uganda 500 students are taught by approximately 25 teachers in five, one story buildings. In 2009 and 2010, CanAssist has funded the construction of a 3000 sq ft building that houses two large classrooms and an administrative area. The building is also used for the university entrance exams that are held annually. 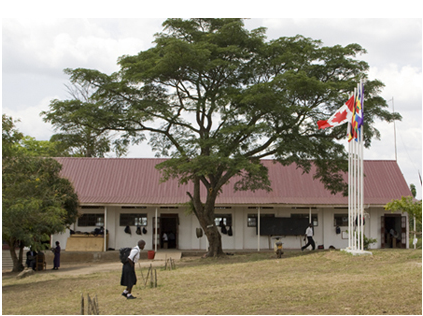 The Canadian flag flies proudly outside the new BLK Muwonge School building. CanAssist has also funded a number of minor improvements to the school including an improved and expanded latrine area, an generator for electricity supply during the all to frequent blackouts in the area, heat tiles for the kitchen area, clothesline for the boarding girls, cabinets for the library area. Currently we are in the midst of constructing a dormitory for the girls who board a the school. Current facilities are crowded and inadequate. In June 2012, seven "CanAssistants" from Kingston, Ontario and Whitehorse, Yukon will visit the BLK Muwonge School. They will bring with them funding for textbooks, laptops and school garden equipment, gifts donated recently to CanAssist for this purpose. If you would like to add to these school supplies, please specify MUWONGE SCHOOL with your donation. Laurel Montrose and her husband James Smith visited the school in June 2010. This YouTube video captures some of their experiences there and brings thanks to CanAssist donors from the head master, Richard Katongole. Our enthusiasm to assist this school to improve its facilities complements well our other education (Hope for Youth, Enkuyan School, Little Stars). In East Africa, students are often able to get public education for their elementary schooling but have great difficulty in pursuing secondary education. This school is providing good education facilities to allow young Ugandans to continue secondary education and even prepare for post-secondary schooling.